Social media is a great place to get connected with people including your long lost friends. However, today it has become one of the best places to make money too. Whether you run a business or you have an expertise in something, social media provides you with the perfect platform to market your products and services. It is imperative that you get to know your audience well. You might have already noticed the general trend of your social media audience through your posts. However, make sure that you do some in-depth analysis before you move ahead. You should check what your audience likes, what they don’t like, or even what they would like to buy. You need to ask yourself a simple question “Would they buy this?” If the answer to that is yes, you’ve got your perfect audience set. It is only when you’ve figured out your audience that you can think of social media affiliate marketing. Information on making money from social media is very limited. Using social media for affiliate marketing can help you monetize your presence on different platforms. You can promote affiliate links on social networks and generate revenue. All you need to do is post it on any social network and whenever a transaction occurs through your link, you’ll get a share of the money. So you need to join some good affiliate networks from where you can get such links. Some good ones out there are CJ Affiliate, PeerFly, and Amazon Associates. I’d recommend either searching on Google or asking fellow bloggers. You can then filter through the programs and choose the ones that you think your audience may like. Make sure that you use high-quality affiliate products. A low-quality product will do more damage than good. On the other hand, a good product will show you the true benefits of social media affiliate marketing. The main criteria for selection of the program should be your audience and not the commission rates. A network that has high commission rates but doesn’t relate to your audience won’t give you any income. However, a network that relates well to your audience but has lower commission will help you make more money. Once you’ve selected the programs, you need to check which ones will give you some actual income. Now you can create posts that have your affiliate links in them and publish them. See to it that you explain the product or service and its benefits well in the post. Only then will your audience see some utility. I’d also recommend creating a redirect link. This is because affiliate links are very easy to spot nowadays. This may put off your audience. However, a simple and clean redirect link should do the job for you and it may even look more attractive to click. Also, make sure that you’re looking at how your post will be beneficial to your followers. This can help you write for them and can improve your chances of generating revenue. Also, keep in mind not to fill your feed with affiliate links. This can hamper your brand’s reputation and you could lose out on valuable audiences. I’d suggest that you first check which options are working out for you and then only use those later. Even then, try not to fill your feed with them. Before you can start selling your services or products, you must first build your reputation. One of the best ways to do this is by using your social media to share high-quality and engaging content that your audience can benefit from. You can use apps like Grammarly and Copyscape to assist you with your writing. Make sure that you use photos in your social media posts. Photos can grab the attention of viewers with ease and engage them a lot more effectively. You can use related photos with your posts and make them look more attractive to the eye. Instagram is the perfect place for using photos and this is where you can see how powerful they are. This can grab the attention of readers and slowly build up your brand’s reputation. On the other hand, bad content can spoil all your social media affiliate marketing efforts. Try to write content that is helpful for your audience. Also, make sure that you don’t use clickbait headlines; they can be bad for your campaign. When your reputation increases, people will automatically start following you for good quality content. You can then start using social media affiliate marketing and start posting affiliate links. I’d recommend keeping a good mix of affiliate links and good-quality posts. You must engage with your audience and not just sell to them. Social media affiliate marketing is all about remaining active and engaging with your audience. In the end, a brand that interacts with their audience will reap the maximum benefits of social media. It’s fairly easy to increase social media follower interaction. To effectively communicate with your audience, use a few relevant social networks only. This will help you dedicate some time to your audience on each network. 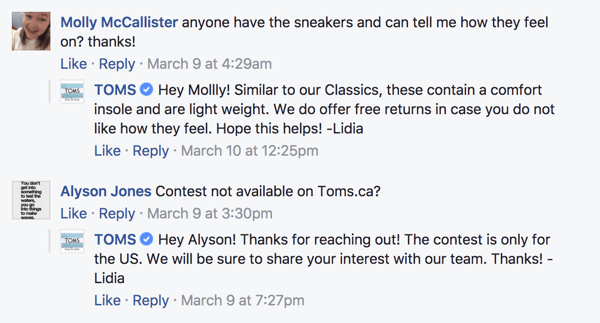 Toms, the shoe brand, gives prompt and useful responses to their followers. You can follow the same tactic to engage with your audience. After you’ve rolled out a few campaigns and sufficient time has passed, you can start analyzing them. It is only once you analyze your campaigns that you can optimize them and get better output. You can do both quantitative and qualitative analysis. Quantitative analysis will include your revenue per post from each program. You can also divide it based on the time of the day, the social network used, the type of content, and more. This will give you an idea of what’s working and what is not. You can change your social media affiliate marketing strategy accordingly and reap better benefits. In qualitative analysis, you will need to check variables that aren’t exactly numbers. This analysis will include the effort behind each post, the time taken for the commission to be paid, link quality, and more. If you can effectively analyze these factors, you can improvise on your social media affiliate marketing strategy a bit more. If you’re new to affiliate marketing, it’s best to learn from people who are already experts in the field. Influencers would be the best people to teach you about successful affiliate marketing, as they regularly promote affiliate links. Use tools like Grin to find highly relevant influencers in your industry. You can filter the results based on category, location, etc.. Once you’ve discovered some top influencers, go through their social media feeds to see how they are promoting their affiliate and sponsored links. Make a note of everything they’re doing right such as the voice they’re using, the kind of images they’re using, etc. This will give you some direction on how you can improve your own efforts. Social media is a powerful tool that can be used to make good money. Follow the steps given above to get started with your affiliate marketing efforts on social media. Remember, post things that are beneficial to your audience and not just to you. This will ensure that your income flow remains consistent too. Do you have any questions related to the methods listed above? Let me know in the comments section below. I’ll try my best to clear all doubts that you may have. Brian Mechem is COO and Co-Founder of Grin, a software solution for companies who run influencer marketing programs. Grin’s software powers some of the best influencer programs in the world, providing insights on ROI and adding efficiency to the influencer marketing process. Before working for web design agency I also worked for affiliate marketing firm and I must admit that social media channels can play great role in sending customers to your affiliates. I used to manage 100+ Facebook pages and the reach I witnessed would take one heck of a time and resources to build but once built then there is not much effort required.